Following Rev. Neill’s initiative, there were occasional services through 1852 and 1853. These were held in the schoolhouse and were conducted by the Lindsay brothers, who were theology students at Queen’s College in Kingston. Although a congregation was officially formed in 1854, it was March, 1856, when they welcomed their first full-time minister, Rev. Alexander Buchan. He had been sent from Scotland by the Glasgow Colonial Society. The congregation had already begun to erect a church building on this site, and there, on Nov 12th, 1856, the Presbyterian formally inducted Rev. Buchan into this charge. Within five years a manse was built. The lovely red brick house which stands to the east of the present church. Rev. Buchan served here for 19 years. In 1883, the Stirling ministry was expanded when it joined with St. Andrew’s West Huntington to become a two-point charge. In 1908, the Stirling Charge became self-sustained. In 1915, Stirling and West Huntington Charges reunited. In 2006, the Stirling Charge once again became self-sustaining. Our first church, built in 1856, was made of wood, and stood in the same location as today’s church. 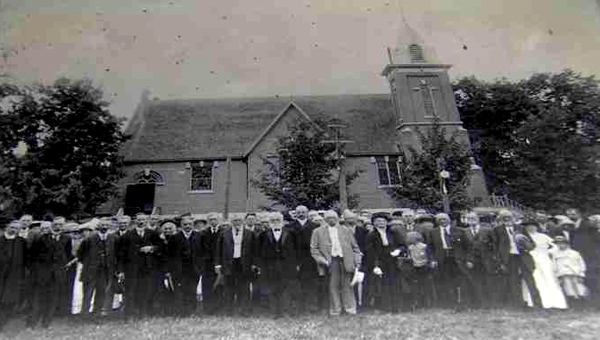 The old frame building was replaced in 1893 by our present brick church. The original pipe organ was replaced with our first electric organ in 1974. In 1988, that organ was damaged by lightening and was replaced by our present day Allen organ.